The stories, observations and memories captured within these pages reflect the events in Canterbury New Zealand, and in particular the city of Christchurch, and the journey its inhabitants have been on over the past eight years since the earthquake sequence began in September 201... read full description below. Always an acute observer of people and the environment, in this new book Rosie Belton once again uses her diarist style to capture with intimacy and immediacy the events as they happened around her, in this case the earthquakes experienced by the people of Canterbury. Nothing could have prepared her, she says, for the severity of the quakes, starting with the first one in 2010, and then the ongoing disruption over the next six years: the grinding reality of living through so many months of shaking and the after-effects. Like many creative individuals, Rosie found that writing about those terrible events as they unfolded developed into a coping mechanism. And now, the result of her careful record-keeping and reflections can be read and appreciated by so many others whose lives have been affected by similarly large-scale natural disasters. It also makes excellent reading for anyone with an interest in knowing more about what it can be like to live in a seismically active country. 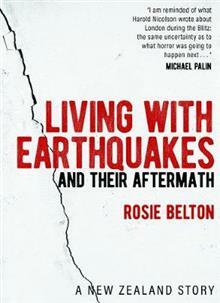 Dedicated to all who face and survive unwanted change, Living with Earthquakes helps us, as well-known author and actor Michael Palin said after reading Rosie's writings, 'to comprehend the incomprehensible, conveying the mixture of bewilderment, hope and desperation very effectively'. He adds that 'it is hard for anyone who still calls the ground terra firma to take in what happened in Canterbury'. Rosie Belton is a Christchurch-based writer and drama consultant with a background in the theatre. She is also the author of Just a Bang on the Head (Craig Potton Publishers 2008)and Wild Blackberries: Recipes and memories from a New Zealand table(Allen & Unwin 2014). Rosie lives with her husband, Mark, in the home and garden they began creating together over 40 years ago in Governors Bay, New Zealand.